Probiotics: Are They GOOD Or BAD For You? Mood and Depression are part of the so called Gut-Brain-Axis. It means that our gut plays an important role in mood regulation thereby prevent depressions. Probiotics exhibit anxiolytic and therapeutic effects conducive to psychological health. ANXIETY AND MOOD ISSUES are not all in your head. But they could be in your gut. 30 BILLION CFU with the BEST strains for MOOD and DIGESTION make it a HIGH POTENCY probiotic… offering digestive, immune, and mental support. PREBIOTIC GOS. The ONLY prebiotic studied to help with anxiety. Prebiotic feeds the good bacteria in your gut for a healthy micro-biome. TARGETED “FEEL GOOD” STRAINS. Including Bifidobacterium Infantis and Bifidobacterium Longum. The TOP preforming bacterial strains to help with mood support and anxiety relief. INTRODUCING….. Lifted Mood Boosting Probiotic! At LIFTED, we believe in beneficial side-effects. Recent studies have proven that adding beneficial bacteria to the gut can reduce anxiety and stress in the body. We’ve included the best bacterial strains to help with mood and the body’s stress response. We created LIFTED because we believed there had to be a better way. Many mainstream medicines cause side-effects, which require more and more mainstream medicines! Something isn’t right with that model! Over the last decade, research has surfaced, showcasing the connection between gut health and many immune issues including: allergies, eczema, asthma, and more. We wanted to create a high quality probiotic with strains targeted for digestive health and immune health, but also MENTAL health. Our probiotics are NOT enteric coated. On purpose. Enteric coating adds extra ingredients that are not necessarily required and the heating process of enteric coating can potentially damage the good bacteria. If you want our probiotic to survive stomach acidity and work at it’s best, take it with food. That’s it! We’ve included a POWERFUL prebiotic to help you feel better. Our blend is especially potent with our PREBIOTIC, GOS– the the ONLY prebiotic that’s been proven to help with anxiety. Our Mood Boosting Probiotic includes 9 of the most HEAVILY researched bacterial strains that have been documented to help with mood and wellbeing. Feel better, NATURALLY, with our Mood Boosting Probiotic! 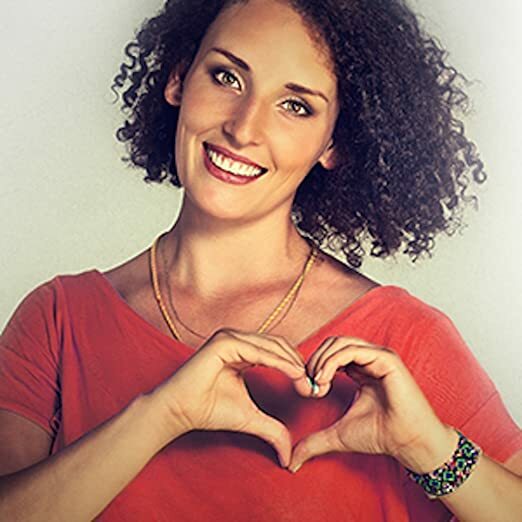 Author PBSPosted on November 2, 2018 November 2, 2018 Categories Mental HealthLeave a comment on Mood Boosting Probiotics! Introducing the Oral Probiotics in dissolvable tablets! “Good Digestion Starts in the Mouth! Use regularly these health probiotics with Streptococcus salivarius K12 help fortify your immune system and reduce the need for antibiotics. The Mars Oral Probiotic with BLIS K12 boosts oral health and immunity and has been clinically proven to protect against recurrent strep throat. Early studies also show that BLIS K12 can reduce recurrence of ear and throat infections caused by other bacteria and viruses. BLIS K12 is pediatrician recommended and approved. Advanced CFU Formulation – These MARS Wellness natural probiotics contain four ( 4 ) billion CFUs of Bliss K12 for premier health support. Long-Term Protection – Add our probiotics supplement to your daily vitamin regimen after a strep throat infection and help minimize recurrence. American-Made Purity – Every bottle of gluten-free MARS Wellness Oral Probiotic is crafted in a GMP-certified facility and is completely kosher and vegan friendly. BLIS K12 is pediatrician recommended and approved. 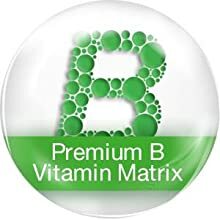 Fortified with BLIS K12, scientists have discovered that by adding this unique supplement to your daily oral routine can help protect against recurrent strep throat as well as other infections. Our patented formula helps to destroy bad breath bacteria so the good kind can create a healthy mouth environment, providing halitosis treatment. Bad breath pills only cover the symptoms, not cure them. Oral or dental health is so important. Not just for hygienic purpose but most important is for health in general. For example our mouth has millions of bacteria mostly bad bacteria like Beta streptococcus, that causes sore throat, tonsillitis, throat abscess and if not properly addressed could lead to rheumatic fever and rheumatic heart disease. Also, this Beta streptococcus in the mouth could affect the kidneys that leads to Glomerulonephritis and eventually to dialysis if not treated. Aside from the above health conditions, some researchers found out that oral gingivitis and periodontitis caused by bad bacteria in the mouth lead to chronic inflammation which is a risk factor in the development of cardiovascular disease. To address this oral health issue, new probiotic-based products are now available as lozenges. It’s true that digestion begins in the mouth. In the study, the researchers used a particular strain of good bacteria, Streptococcus salivarius to treat oral diseases like cavities, gingivitis, periodontitis and other throat infections. They let the subjects to take probiotic lozenge 2 x a day after brushing the teeth for 1 month. They also found out that the Streptococcus salivarius produces enzymes and make the environment for the bad bacteria inappropriate for survival ( Dextranase and Urase). These bad bacterial killings lead to reduction of dental cavity caused by Streptococcus mutans and other throat and oral diseases. Lastly, just a reminder, that oral probiotic lozenge supplementation is not a substitute for routine oral care like regular brushing, flossing, and visiting your good dentists! P.S. If you want to have strong oral immune system and prevents oral diseases that threatens your health. Please see this recommendation. 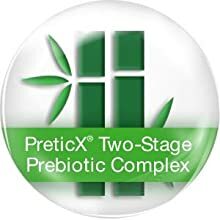 I want to recommend this superb probiotic product, Reg’Activ Cardio Wellness, that uses world class patented probiotic strain Lactobacillus fermentum ME-3. 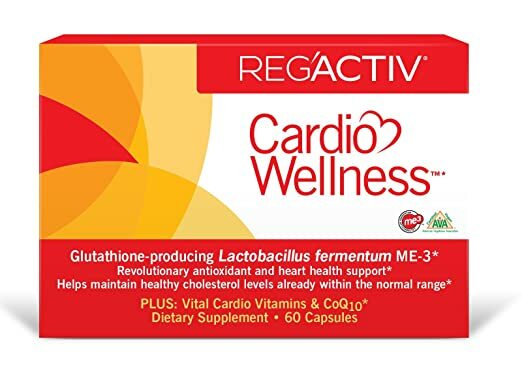 This Reg’Activ Cardio Wellness contains the revolutionary probiotic strain Lactobacillus fermentum ME-3 that has been studied for over 20 years, ME-3 produces glutathione and ME-3 has been found to support healthy glutathione levels in the cardiovascular system. Glutathione is the body’s “Master Antioxidant.” It is used by every cell in the human body, and it’s absolutely vital for heart health. In the cardiovascular system, glutathione affects how the body processes LDL cholesterol in a healthy fashion. Glutathione’s effects ultimately support the health of the endothelium (vascular lining). Each daily dose (2 capsules) contains 6 billion viable bacteria. This is like ingesting 6 billion little glutathione manufacturing factories every day, which results in a constant production of glutathione. In human clinical trials, people taking ME-3 gained a 49% increase in the ratio between reduced to oxidized glutathione, which equates to a significant increase in levels of active glutathione in the body. Coenzyme Q10 (active form, Ubiquinol) – Supports healthy energy production in heart muscle tissue. Together let’s take this supplement and feel the brand new you! I have strong family history of allergy, asthma and eczema. I experienced to have itchy skin when I was in early twenties after I took a bath I started to itch all over my body as I noticed lots or scratch markings all over my skin (dermatographism). After few minutes to an hour the itchiness disappeared and I was back to normal. I could still recall taking antihistamine (Cetirizine) almost everyday just to relieve the itchiness and rashes. It took me almost a year to finally stop taking cetrizine. This was the time when I was in my mid thirties that I learned about probiotic supplement to treat Atopic Dermatitis (AD). I tried OMX Probiotics for one year and I was so happy. My allergy was completely resolved. I stopped my OMX probiotics about two years and I had no recurrences of allergy. I thought I was already “cured” to my atopic dermatitis. Until one year ago I started to feel itchiness again but this time was specifically on my palms. It was so itchy, red and there were small blisters. Once those blisters erupted they would be very painful and started to become very dry and flaky. This condition is called Dyshidrotic or Pompholyx Eczema. I tried to resume OMX probiotics but this time it didn’t work. This resulted to the use of steroid-based cream or ointment that made my finger creases to disappear and thus made my palm skin thinner and easy to break and crack. I stopped using those medium to high potent steroids and searched probiotic skin spray and I started using LiviaOne Topical Probiotic Spray. For almost one month now my usual eczema regimen is to first remove stress in my life. Start morning prayers. Then I wash my hands with high moisturizing anti-eczema soap the Shea Moisture Black African Soap. After washing, I spray my hands with LiviaOne Probiotic Spray and let my hands dry for about 5 minutes and I do it in the morning and evening. Lastly I apply them with Aveeno Eczema Therapy or other moisturizing agents of your choice, in the morning and in the evening and as needed . I personally love donning dry hand gloves in the evening for better skin absorption and prevent my hands from drying out quickly. Before I start my probiotic-based eczema treatment, I use first a dermatologically tested Healing Body Balm to immediately relieve the soreness, blisters and inflammation. 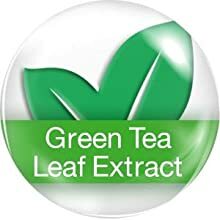 I use this for break outs of my eczema. I apply as needed for 2-3 times a day until soreness and blisters disappear, but not to use more than 1 week. Once I see that my blisters and soreness are gone, I immediately go back to my eczema regimen. You will notice that the break out will recur infrequently and sometimes free for more than a month. I still continue to take probiotic capsules but as per experts’ recommendation of 20-50 millions CFU per day, I take Probiotic 40 Billion to help my gut and gives added benefits on my skin health care. So far so good… I will give you my feedback and review again to this eczema regimen. Do probiotics heal ailing skin? In fact a lot of studies were done to test the effectiveness of probiotic supplementation to treat or prevent Eczema like Atopic Dermatitis (AD), which means skin allergy in a simple term. According to National Eczema Association that the quest in finding solutions to skin problems are still very much progressing. The past studies showed different results among children with eczema who were given probiotics orally. However, most of the clinical trials slightly but not significantly favors treatment of Atopic Dermatitis or Eczema. That clinical studies done since 2008, 2010 and 2012 respectively are still continuously evaluated until they’ll come up with the much significant outcomes. According to scientist Markus Lehtinen,PhD of HOWARU probiotic culture, that majority of our immune cells reside in our gut and confer remarkable anti-inflammation or anti-oxidant effects thereby influencing cascades or chain reactions throughout the body to have healthy immune system. He added that the skin is an immunological organ and being influenced by the immune system balance. In Korea, a recent study done by Kyung Hee University researchers, which showed handful of successes using probiotics in acne patients. They used 56 acne patients and were given Lactobacillus-fermented drinks or placebo for 12 weeks. They noticed significant effects in terms of skin lesions based on acne grade and oil/sebum accumulation around the acne sites among patients in the probiotic drink groups compared to placebo. To make the study more convincing, they crossed study them by adding Lactoferrin (anti inflammatory milk protein) to the probiotic drink group. The result? Better improvement in the skin lesion and in oil/sebum production. This study supports that probiotics can have a potential effects in acne management. Recently, experts on probiotics and different medical field experts proposed to increase supplementation of 40-50 billion CFu/d probiotics and mentioned the strains that really work in the inflammatory response on the skin like Lactobacillus rhamnosus, Bifidobacterium lactis and Lactobacillus acidophilus probiotics in single or multi-strain formulations currently hold the most promise for prevention and treatment of eczema like atopic dermatitis. What if you put the probiotics on the skin? Skin is the largest organ in the human body. This is also a part of the immune system that protects us from harmful effects of bacteria. The skin is our first line barrier against diseases. There are discussions regarding the application of probiotics on the skin. Since the skin environment is far different from the gut, then how can good bacteria live and grow in a low moisture level, different temperature and substrate conditions on the skin? Some experts said that means of treatment through skin or topical route would defunct the international meaning of probiotics which is “a live microorganism that when administered in adequate amounts consumed, confers a health benefit”. Providing the nature of skin those probiotics are unlikely to survive. However, due to this conflict, one of the leading probiotic nutriceutical companies studied and tested their patented probiotic strain (Lactobacillus coagulans, GBI-30,6086) for skin care purpose. Instead of using live microorganisms directly on the skin, they made used of Lactobacillus coagulans fermentation byproducts to rejuvenate skin. These byproducts include lactic acid, bacteriocins, enzymes and other important substances to help rebuild skin immune response to infections or inflammations. These substances are now being used as main ingredients in lotions, soaps and creams. Instead of calling them probiotic skin care products, they preferred calling them probiotic-derived skin care products just to remove confusion to the international meaning of probiotics. According to Dr. Whitney Bowe, a renowned New York-based dermatologist, “There are actually specific probiotics strains that have been shown to promote ceramide production, which are healthy lipids naturally found in skin that trap moisture and strengthens the skin barrier”, she added, “There is a lot of science emerging that certain strains taken orally and applied topically can hydrate the skin.” This means that probiotics can still be applied directly on the skin for the purpose of ceramide production that only requires 15 minutes and do not need probiotics to stay or survive on the skin for a long time. This ceremide production experiment was done by researchers from University of L’Aguila in Italy using Streptococcus thermophilus. Lastly, even though their are still no claim for the cure of eczema, I think there is no harm in trying those studied and tested probiotics whether we take them oral or topically. And one more point, remember that stress is playing a big part on the allergic process especially in eczema. This was proven by the Gut-Brain-Skin Axis Theory proposed by dermatologists John Stokes and Donald Pillsbury on 1930. They studied the relationship of having emotional stress and poor gut or digestive health resulting to a poor skin health. Stay stress free as possible and take probiotics orally and topically. Please read my report on Topical Probiotics and how I personally manage my eczema. Author PBSPosted on April 8, 2018 April 24, 2018 Categories Skin and Hair CareLeave a comment on Probiotics For Skin Care? Sensitive to coffee or caffeine effects? No worries…. Introducing ProbioSlim Advanced! 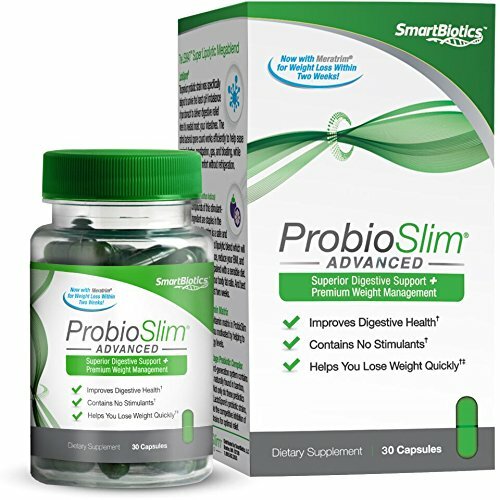 ProbioSlim Advanced is a premium probiotic supplement with an innovative formula that combines one of the most efficacious and resilient probiotic strains with a stimulant-free, clinically researched weight loss ingredient called Meratrim for results starting within just two weeks as part of your healthy lifestyle. Begin your journey toward better digestive health and a new you! 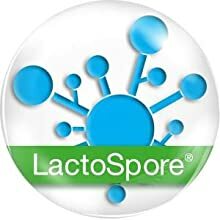 LactoSpore, a premium probiotic strain that survives the harsh acidity of your stomach, helps ease occasional diarrhea, constipation, and gas. It also reduces belly bloat, helping you feel better and look slimmer. Unlike many weight loss supplements, ProbioSlim Advanced is stimulant-free, so you can see the results you’ve been craving without experiencing any caffeine jitters. ProbioSlim Advanced is formulated with Meratrim, a stimulant-free, clinically researched weight loss ingredient that helps you lose weight starting in as little as two weeks! This resilient probiotic strain utilizes a spore that protects itself from the harsh, acidic environment of your stomach so it can safely reach your intestines. The optimal bacterial spore count works efficiently to help ease occasional diarrhea, constipation, gas, and bloating. 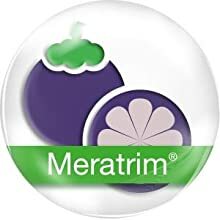 Meratrim is a safe and incredibly effective anti-adipogenic and lipolytic blend which will help decrease your waist circumference, reduce your BMI, and lower your overall body weight when paired with a sensible diet. It also synergistically helps improve your body fat ratio. And best of all, it works quickly – starting in just two weeks. The sophisticated vitamin matrix in ProbioSlim Advanced keeps you motivated by helping to support your energy levels. This innovative third-generation system contains distinct prebiotics naturally found in bamboo, honey, and milk. Not only do these prebiotics specifically feed LactoSpore’s probiotic strains, they also promote the competitive inhibition of non-beneficial strains for optimal relief. 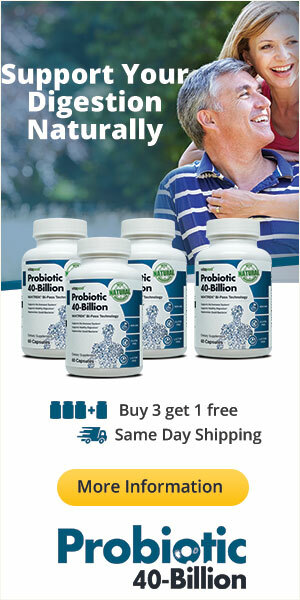 Try this amazing weight loss probiotic product to feel a brand new you! Friend I recommend this probiotic weight loss product for you. 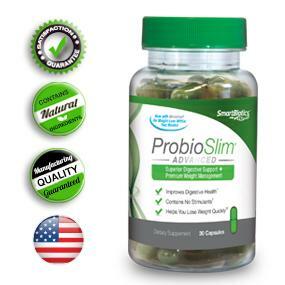 The popular probiotic supplement with distinct ingredients to help you lose weight naturally! 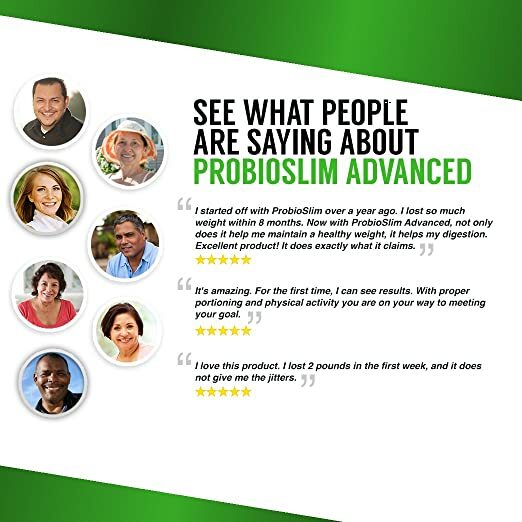 ProbioSlim is an innovative probiotic supplement with ingredients for comprehensive digestive support, plus distinct compounds to help you lose weight safely and effectively as part of your healthy lifestyle. 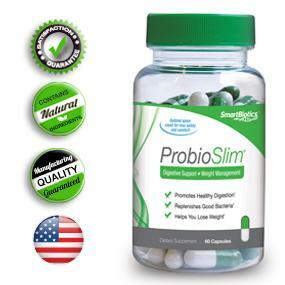 The two primary benefits of ProbioSlim are perfect complements: Supporting your digestive system while you work to burn fat and lose weight is a smart decision for overall health; and, less bloating means you’ll look slimmer, too! Don’t leave your health up to chance. Take control of your digestion and your weight with ProbioSlim. This resilient probiotic strain utilizes a spore that protects itself from the harsh, acidic environment of your stomach so it can safely reach your intestines. Probiotics promote healthy digestion, and help relieve gas, bloating, constipation, and occasional diarrhea. This powerful weight management ingredient naturally increases thermogenesis and adipose tissue oxidation, helping you cleanly burn fat as part of a reduced-calorie diet. 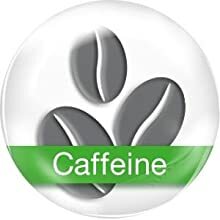 Fight the dreaded and awful feeling of diet fatigue with ProbioSlim’s energy-boosting kick of caffeine, which helps control your appetite and keeps you motivated while you lose weight. However, if you are sensitive to caffeine effects or coffee…you maybe interested to see this caffeine free ProbioSlim Advanced! 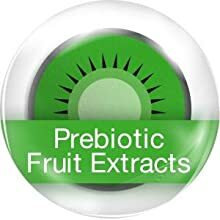 Kiwi, fig, and papaya extracts work as prebiotics, providing energy and vital nourishment to the probiotics contained in LactoSpore. Try this weight loss Probiotic supplement and feel the brand new YOU! Are you sensitive to caffeine or coffee drinks? Try this caffeine free Probioslim Advanced! I just like to share with you my opinions regarding the management of cholesterol in our body. When we go to our doctors and check our blood chemistry especially the cholesterol or lipid profile our doctors usually check our LDL or the “bad cholesterol”. If the LDL is beyod the normal value, your doctor will give anti-cholesterol medications like simvastatin, rosuvastatin, atorvastatin, pravastatin etc. and these meds usually would continue for 3-6 months or even more than a year. Some of you especially those taking synthetic anti-cholesterol regimens might experienced muscle pain (myalgia) and elevated SGPT or SGOT (these are enzymes found in the liver) and sometimes can lead to fatty liver as seen in the ultrasound. My take on this is simply emphasize low cholesterol diet and once you have lowered your cholesterol to near target level you may want to get a more natural way of maintaining cholesterol metabolism. There are Probiotics like Lactobacillus fermentum (ME-3) and the Unique Spore-Forming Probiotics Lactobacillus coagulans (IS-2), that will lower not just the LDL level in the usual laboratory results but deeply via inhibiting the oxidation of LDL through counteracting free radicals and served as anti-oxidants to prevent our blood vessels from injury and inflammation brought about by high saturated fat diet and high blood pressure. I highly recommend that you take Probiotic supplement that contains lipid lowering strains like Lactobacillus coagulans or Lactobacillus fermentum. Thank you and remember that life is probiotic! To know the innovative world class probiotic product that lowers bad cholesterol, please read my report here. Probiotics are the good bacteria that line your digestive tract and support your body’s ability to absorb nutrients and fight infection. There are actually 10 times more probiotics in your gut than cells in the rest of your body. When there is an imbalance in your gut from low levels of good bacteria, it becomes a breeding ground for bad bacteria, yeast, viruses, fungi and parasites. The only way to replace the essential good bacteria in your body is to eliminate foods that feed bad bacteria and start consuming probiotic-rich foods and probiotic supplements. That’s where Probiotic 40 steps in. Probiotic40 should be taken twice a day. As with any digestive treatment it is always best to have a good diet, and speak to a health professional once irritable symptoms persist.